Getting an overview of your sales, top customers and products is quick and easy with BI360 dashboards. With intuitive, drag-and-drop simplicity, you can customize your data and create dashboards on the fly with pre-defined widgets and modules. BI360 dashboards are web-based for both designers and end users, and offer total visibility into your business. Like every other BI360 product, our dashboards are created for business users and don’t require advanced levels of technical expertise. 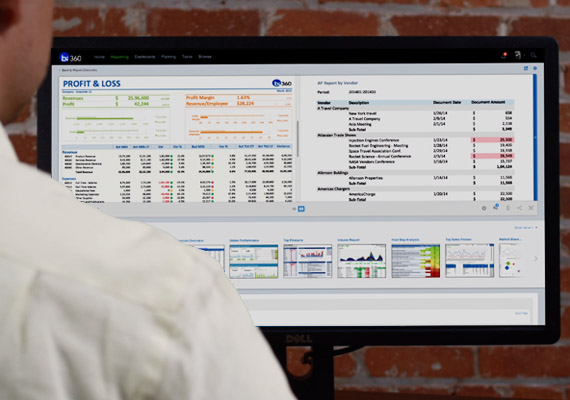 Plus, they offer out of the box integration for real-time ERP or data warehouse-driven dashboards. BI360 dashboards are part of the BI360 Portal and come integrated with the BI360 web reporting module, providing a single environment both for financial reporting and for dashboards. In other words, if a manager is looking at a sales dashboard, he or she is just a click away from running a live balance sheet report and drilling down into a cash account to see live transactions from the ERP database. BI360 is the only BI suite that provides this type of flexibility within a single solution and a single web portal! Watch this quick demo of how to easily design your own dashboards with key metrics in just minutes!